We are so pleased to announce the launch of two new paper pads from First Edition. Explore an exciting world of pastel unicorns, fluffy clouds, unicorns, and all things adorable with Chasing Rainbows. Across 48 sheets, find charming repeat patterns of hearts and stars, and add instant magic to your craft projects with glitter effect and iridescent papers to help create the cutest crafts around. Behold all of the magic of a beautiful country garden with the charming new Gardenia paper pad. A must-have for any nature lover, these papers feature dainty florals and stylish botanical prints across 48 sheets of quality 200gsm heavyweight cardstock. An easy way to connect with nature in your crafts, these papers also feature a spot UV design, pearlescent effects and beautiful fabric textures amongst the soothing floral patterns to create a sense of serenity in your handcrafted projects. Both of our brand new First Edition paper pads will be available in three sizes: 12” x 12”, 8” x 8” and 6” x 6”, making them perfect for cardmaking, scrapbooking, DIY projects and everything in between! And if that wasn’t enough, also coming soon we’ve got scrapbook albums to match each of these new paper pads. 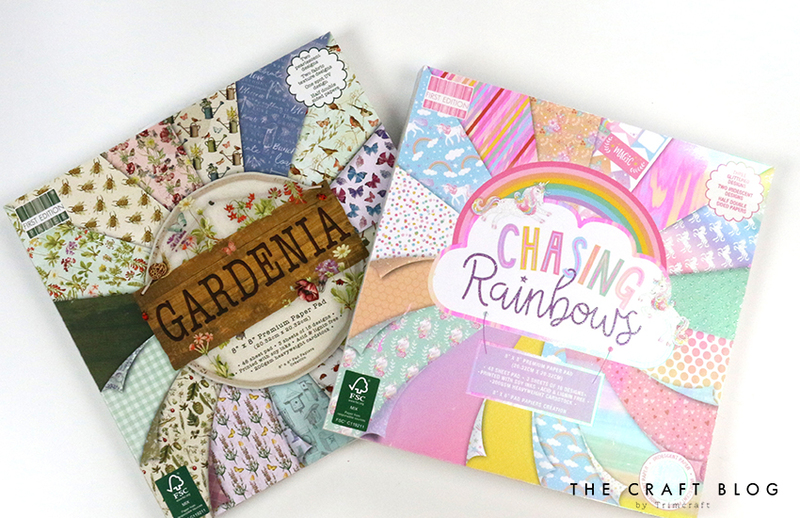 Featuring beautiful cover designs taken from patterns within the paper packs, these albums will make a wonderful home for any treasured memories. Inside, the albums contain 20 refillable pages and a Snapload Binding system to hold the pages together, so that additions can be added. We’ll be posting lots more about these wonderful paper pads across our social media accounts, so make sure you’re following us on either Facebook, Twitter or Instagram for more sneaky peeks. Make sure you keep your eyes peeled across stores over the next few weeks to get your hands on these, too! Don’t forget to let us know what you think by leaving us a comment below, we love to hear from you. They both look fantastic :) I know many lovers of gardening, could make perfect cards for them! Love the Gardenia one. Beautiful colours and designs.